on my 86.5 it’was torn ,getting in the way of windshield wiper motor. How important is it to replace if I don’t drive in the rain. What is it’s function beyond keeping water off? I've had this problem as well. I think it's a result of not having the cover properly in the retaining clip on that side. I found that bending the clip down aids in getting it installed and then I put my hand under the cover and bend the clip back up when installed. It seems to help. There are tabs that hold the cover up against the cowl to keep it out of the wiper linkage. They get bent down, or the cover is accidentally installed without fitting the rear edge above the clips. With the cover removed, you can run your fingers across under the front lip of the steel cowl panel to find the clips. Make sure they are not bent down. While you may not drive in the rain on purpose, there’s still a chance you wash the car. That plastic cover protects the wiper motor and linkage, the blower motor and wiring from the water. Jerry Feather makes an interesting replacement, including stickers. Dr Bob said "There are tabs that hold the cover up against the cowl to keep it out of the wiper linkage." - couldnt find these tabs on my body, but Jerrys cover stays in place ok, probably because of the way the front edge locates. Also on my MY the wiper motor seems to be mounted differently, and I had to cut a clearance hole in the cover. Its RHD , but I dont think thats relevant to wiper location. With the plastic cover removed, look/feel back up under the metal cowl panel. 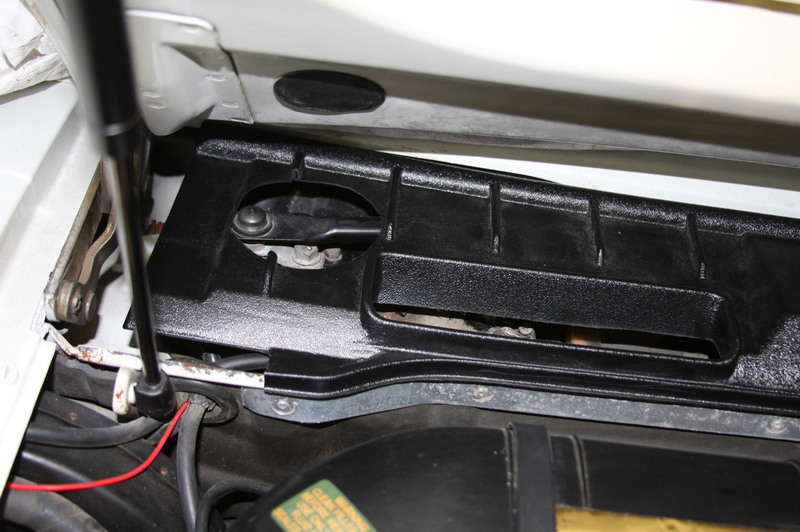 The rear of the plastic cover fits on metal tabs under the cowl panel, supporting he rear edge of the plastic cover against the metal panel and keeping it above the wiper linkage. It's easy to fit the plastic under the tabs, where it will be subject to the ravages of the wiper linkage. The tabs may also get bent down so they do a lesser job of supporting the plastic cover. You also seem to be missing the rubber molding/sealing strip that secures the cover to the firewall panel, and keeps engine bay fumes from the fresh air inlet to the cabin. Perhaps it's off for your picture? My car is under cover in hibernation or I'd snap a picture and share. Dr Bob, I did discuss the tabs with Jerry when I got the cover, and I did look without result. My original cover covered less than half the area (and was VERY flimsy, cracked) so this one is a big improvement.